The perfect gift for the redneck in your clan. 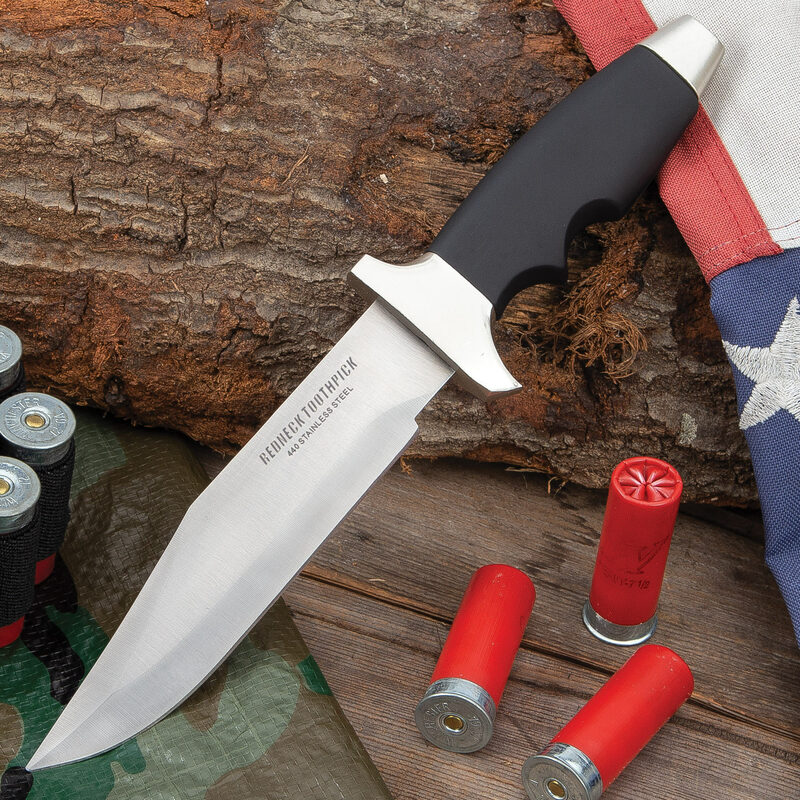 A classic fixed blade fighting knife with a 6 1/2" blade constructed from 440 stainless steel with laser etch. The impact resistant handle features cast metal tang guard and pommel and provides a tight grip. Includes classic sheath. 11" overall. This is a cheap knife however it can be disassembled and some the JB weld applied but that will not correct the poor design. A much better concept would of been to stamped the whole base knife;reduce the blade length by an inch & the depth by 1/2 inch and increase the tang to the pommel. Considering the price it is not bad but could of been much better and simplified the production process. I bought the knife thinking for $5 you can not be much. When I got it, it was much more than I expected. Very sharp, fairly nice sheath. I was very happy with it. good knife for the price. Be aware that the tang is not advertised as full tang, I think the tang probably only goes about 1/4 of the handle deep. However, the blade (after minimal use) seams to secure. Needs to be sharpened to get to "razor sharpness". Good knife for a new collector. Purchased this knife on $5 Friday, when I took out of box and plastic the screwed pommel was loose and fell to the floor. Took it apart and noticed a threaded metal bar spot welded to the blade badly welded. The bar was rusted bad, I cleaned it up with Ballistol and JB welded around the spot welded and the pommel to the screw. Will use this for a tool box truck knife. An unbeatable value and quite a looker. The blade is well made. sharp, and attractive. The handle is more like one of a diving knife. I couldn't be happier with this purchase. Highly recommended. Another perfect 10. Haven't put this to any heavy use but it feels good in the hand and the blade is satisfactory. I'm not big on rubberized handles and this one rests well in the hand. Not bad at all. I bought 2 and gave one to my redneck Bro-in-law. Afterwards I noticed that it says "Redneck Toothick" and NOT "Toothpick" on the blade. He didn't notice it but I did. Oh well, for the money, it's a pretty solid knife. The snap on the cheap plastic sheath broke the first time I tried to unsnap it so I replaced it with some velcro, and the reinforcing rivets on the sheath are worthless, so I replaced those with some larger, solid rivets. After adding a conch to the sheath, the whole thing looks pretty sharp now. After polishing and putting a better edge on the blade, I now have a knife that looks great in my collection and is also functional. This is NOT a complaint review, I'm just stating a few facts, the knife itself is awesome and well worth what BudK is charging for it. Great knife it's good for any use. It didn't come sharp but a 6 swipes on my sharpener and it's as sharp as ever. Really good knife! Great knife.good feel in the hand.